Many of you know my personal health story. Living a healthy life has not always been easy for me. In high school & college I struggled with my relationship with food, my body and my self-esteem. This unhealthy relationship developed into years of struggling with multiple eating disorders from over-eating, starving myself, bulimia to over exercising. Fast forward to today and I have learned how to have a very healthy and balanced relationship with food. I now respect my body and love my body, not because it’s perfect, but because of all that my body is capable of. We all have a body that is capable of going through and doing amazing things! It was a long journey for me to overcome my health struggles. It was a choice to heal, to overcome and to treat myself with kindness. I understand what it’s like to struggle with living a healthy life and it is one of the main reasons I started Healthy Grocery Girl. I want to help others overcome their health problems & go on to live a maintainable, realistic and enjoyable healthy life in body, mind and soul. My Faith was a huge part of my disordered eating healing process. Without my Faith I would not be who I am or where I am today. That is why I am so honored to be asked to participate as a Guest Teacher in my friend Maddy Moon’s new program Scripture, Food & Healing. 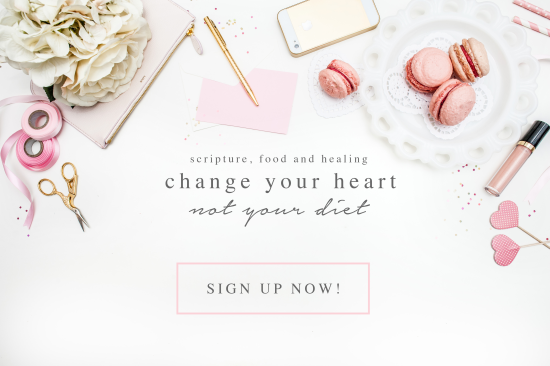 If you are exhausted and emotionally done with food anxiety and you desire to enjoy a meaningful life without obsessing over calories or exercise than I would highly recommend this program! You can learn more & join the Scripture, Food & Healing program here.